Data shows increased homicide rates and record auto theft rates for the month, while decrease in arrests. RIO DE JANEIRO, BRAZIL – Data released by Rio de Janeiro’s Instituto de Segurança Publica – ISP (Public Security Institute) shows that February of 2017 was one of the most violent months in the state’s history, with violent death rates increasing by 28.1 percent and vehicle thefts by 40.3 percent in relation to February of 2016. Police confrontations in Rio have led to an increased number of violent deaths in the state in February, photo by Tania Rego/AgBr. In a press statement released on Tuesday night, the ISP reiterates that it has as a priority ‘the preservation of life, peaceful coexistence and reduction of crime rates in the state’. The numbers also show that February of this year was also violent when it came to confrontation with police forces. 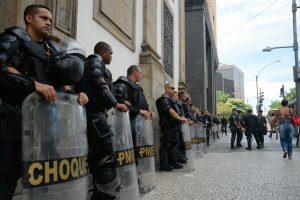 The number of homicides resulting from police action in Rio de Janeiro increased by 71 percent during the month compared to February of last year, with a total of 84 deaths recorded in the month from police action. The report shows that violent crimes in the state rose from 481 victims in February of 2016 to 616 victims in February of this year, while car thefts increased from 3.056 to 4,287 in the same comparison base. While thefts and violent deaths increased, the number of arrests and the number of guns apprehended by police decreased. ISP data shows that there was a reduction by 25.9 percent of gun apprehensions during the month. The data also reveal that police officers made 33.2 percent less arrests in February of 2017 when it came to adults and over 51 percent less arrest when it came to minors when compared to the same time last year. 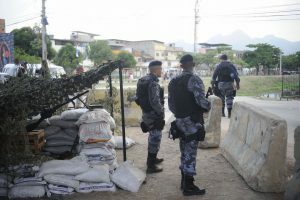 Police at an outpost in the Complexo da Maré favela in Zona Norte of Rio, photo by Fernando Frazão/Agência Brasil. Julia Michaels, another American expatriate, author and the journalist behind Rio Real Blog lives in Ipanema and told The Rio Times that the sense of a lack in security on the in Rio corresponds with the new crime statistics.